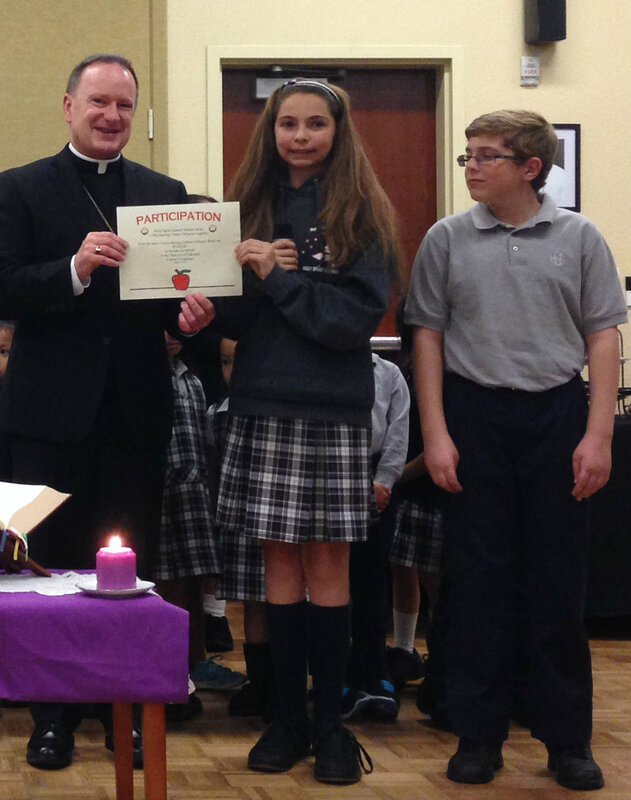 Last week’s activities began on St. Patrick’s Day with an early Mass at St. Patrick’s School in Rodeo. I visited the classrooms as the students arrived at 7:30 a.m. There was a lot of buzz in the air, as everyone was dressed for St. Patrick. Some kids even had green hair. 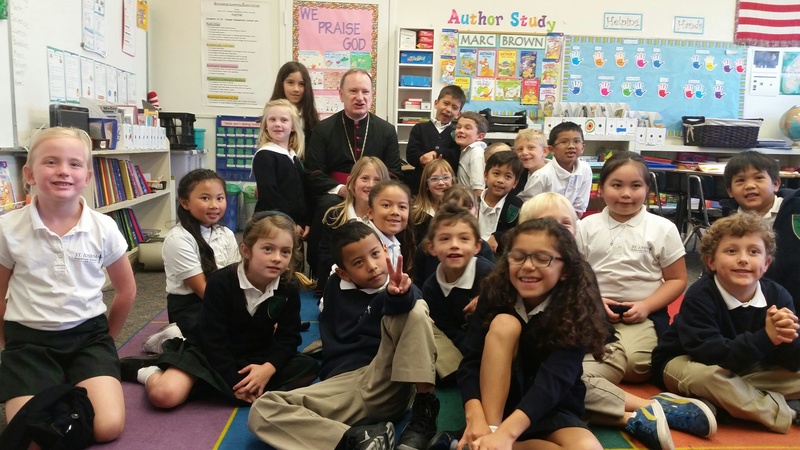 I found very happy children, yet reverent and focused during the morning prayer-assembly and later at Mass. They also have a full kindergarten, as well as preschool, and what looked like pre-pre-preschool . . . for babies! Just like when visiting Santa, babies cry when visiting the Bishop! 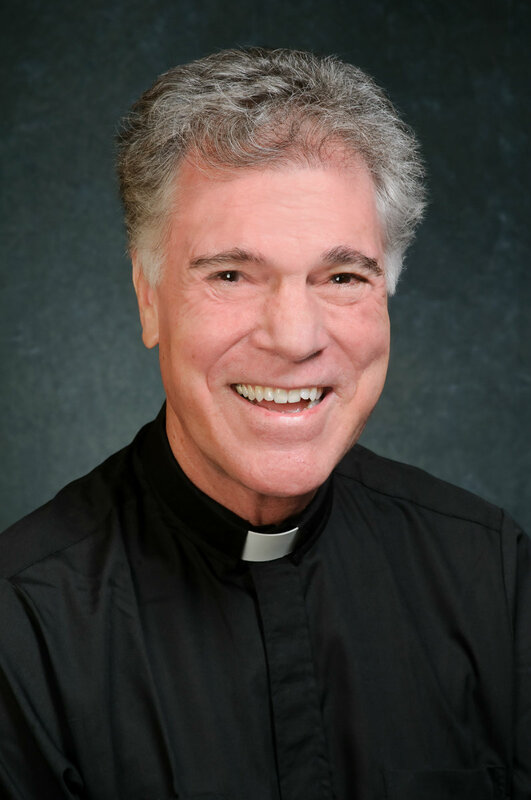 Later on St. Patrick’s Day we held the funeral Mass for Father Seamus Genovese. 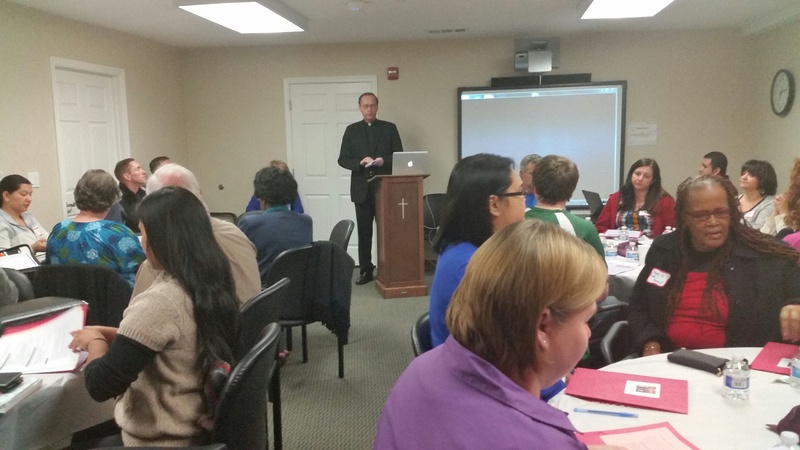 There was a very impressive turnout of parishioners and friends, as well as diocesan priests. Fr. Seamus was my neighbor . . . just a twenty minute walk across the top of Lake Merritt. He always had a drink and a place ready at the table for guests who dropped in for dinner. May he rest in peace! 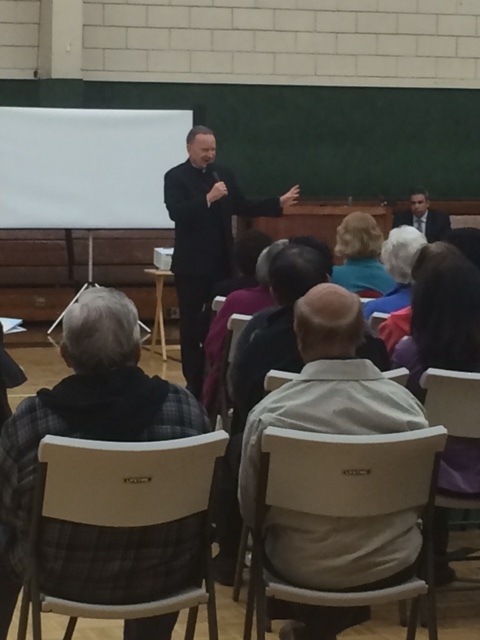 On the evening of St. Patrick’s Day, when many people are having “a wee dram of the dew” or at least an Irish Coffee, a couple hundred parishioners of St. Joan of Arc parish in San Ramon came to hear me give a talk on “Discernment of Spirits, according to St. Ignatius Loyola.” This is a method to discover God’s will in one’s life through following the influence of good spirits and recognizing the deceits of evil spirits. We had a lively discussion. I was glad to see a van full of teenagers attending, as St. Ignatius’s method is particularly helpful in deciding which of many paths to follow in life. Last week I continued my Capital Campaign parish visitations with visits to Holy Spirit Fremont, and Good Shepherd, Pittsburg. A large group of students from Holy Spirit School came to the evening reception and presented me with a Pledge for $2,500! That’s a lot of sacrificial Twinkies. As I go around the diocese, it is heartening to see children from many of our schools participating in our campaign to Reclaim Christ’s Mission Together. Thank you, Holy Spirit students. In Pittsburg the parish has already achieved 25% of their goal, and I was touched by the number of people who approached me after our presentation to increase their pledges. Thank you for your love and generosity, Good Shepherd! 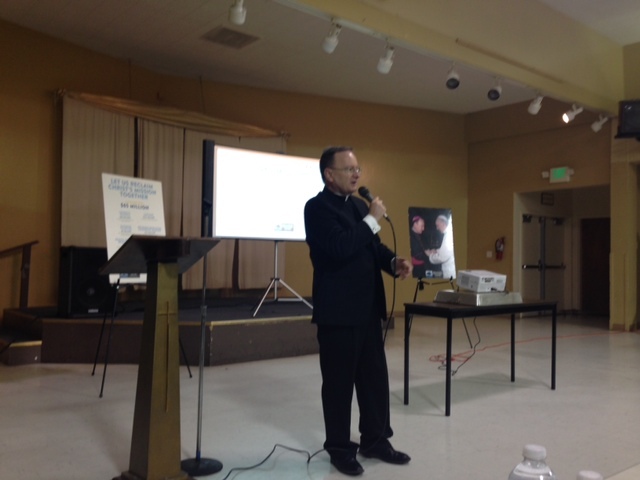 On St. Joseph’s Day, March 19, I was invited to St. Joseph’s Grammar School and St. Joseph’s High School in Alameda. We celebrated two Masses in the Basilica, one for each school. We could have had only one Mass, together, in the gym . . . but using the historic church is so much more conducive to prayer. 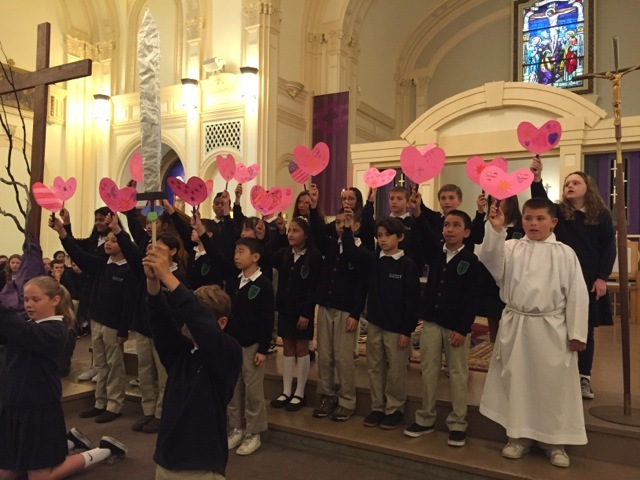 The elementary school students sang a song at the end of Mass, complete with sword and shield, and hearts of love. When I visited the Second Grade, the children presented me with a spiritual bouquet. Each “flower” represented a Hail Mary that the kids prayed, complete with a special intention. They read off their intentions. One of them said “We pray that Bishop Barber will be the best bishop in the whole world!” I think that role has already been filled by Pope Francis. But what a nice prayer. I’ll try and live up to that prayer. 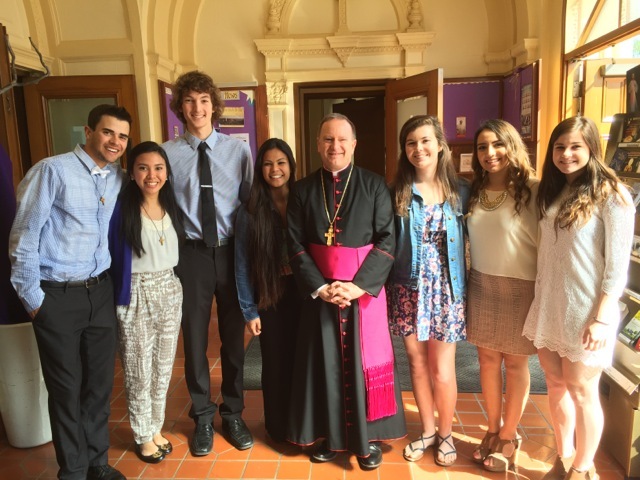 These St. Joe’s High School students gave me a full tour of the campus. With 415 students, the school has a close community spirit. It is one of the very few remaining “parish high schools’ on the West Coast. Fr. George Alengadan and his vicar, Fr. 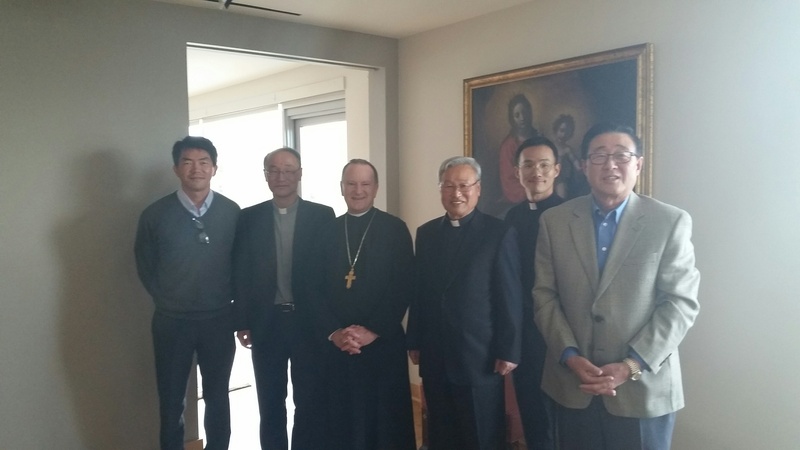 Thi, invited us for lunch — together with the members of the Diocesan Presbyteral Council. We took advantage of Father’s hospitality to have our monthly Council meeting. Thanks, Fr. George! 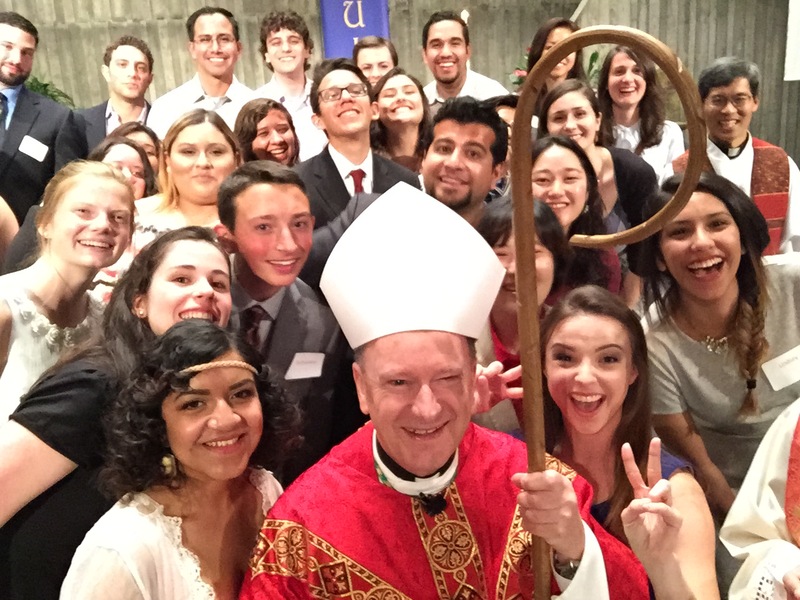 On Saturday I went to St. Mary’s Church in Walnut Creek to confirm 88 young people. Many family members and friends had to stand throughout the Mass, as the church was filled to overflowing. 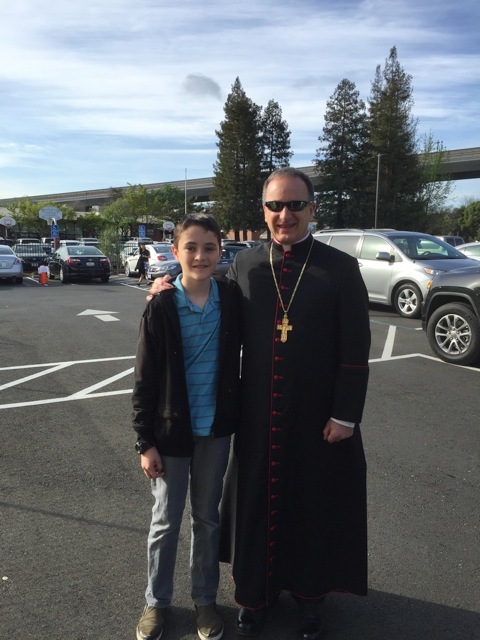 One young fellow, Ian Mannix, Seventh Grader at St. Mary’s School, waited patiently in the parking lot for some time, protecting my parking place. Thank you, Ian! 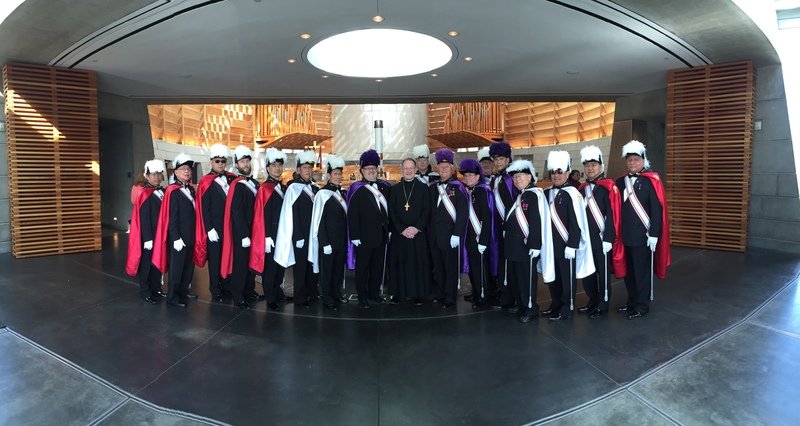 On Saturday evening, our Hispanic Ministries division of the Department of Faith Formation and Evangelization sponsored a concert in Christ the Light Cathedral featuring Hermana Glenda, a nun from Spain. 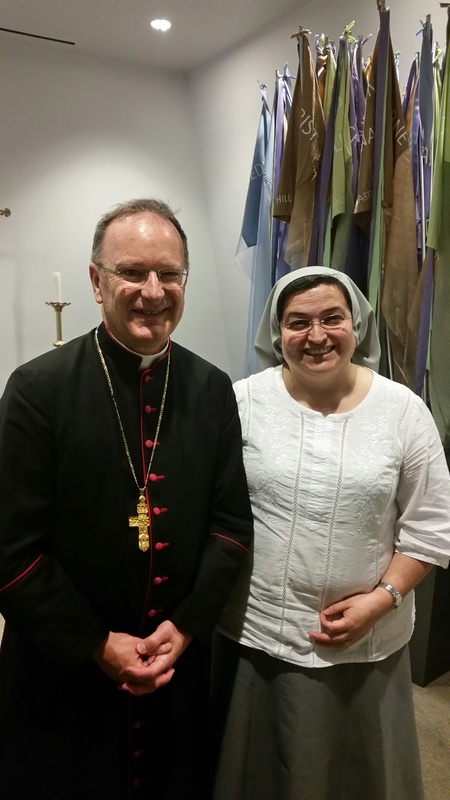 Meeting her beforehand, Sister Glenda told me that although she has a degree in Scripture from the Jesuit Pontifical Biblical Institute in Rome, God has called her to teach scripture through singing. She does this quite well, as concert-goers were led not only to listen to her music, but to pray. 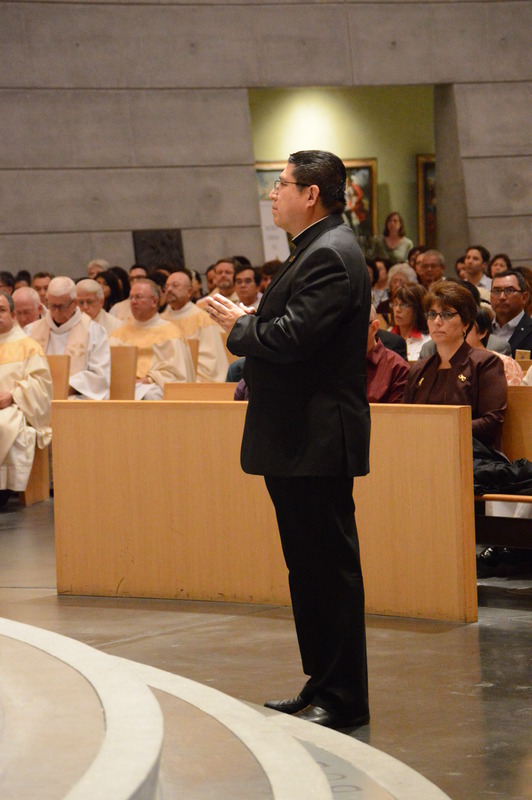 The event raised about half the funds needed to support the annual diocesan Our Lady of Guadalupe Pilgrimage, Procession and Mass. Since meeting her, I’ve been listening to Hermana Glenda for free on Pandora. 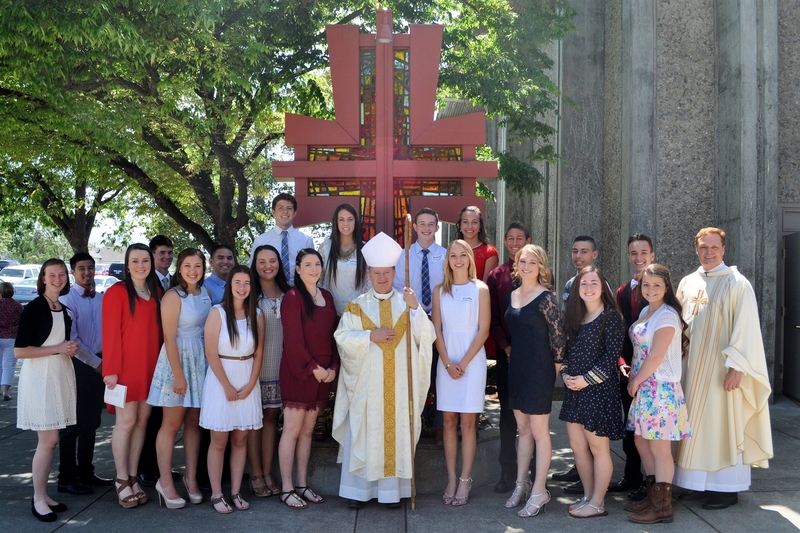 In the morning I celebrated Mass and Confirmation at St. Margaret Mary’s parish in Oakland for 15 students. 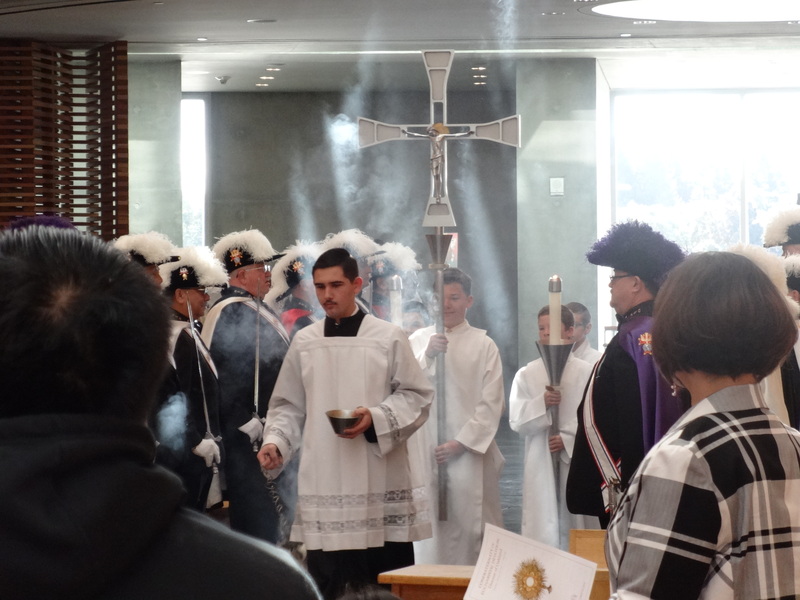 The Mass and Confirmation rite were in Latin, celebrated in accord with the post-Vatican 2 “Novus Ordo” Missal. The students responded to the renewal of their baptismal promises with a loud “Credo!” (“I believe”). St. Margaret Mary’s is known for celebrating weekly and daily Mass with both the Ordinary and Extraordinary forms of the Roman Rite. Since the group was small, I was able to quiz the kids about who they chose as their confirmation saint-names and why. 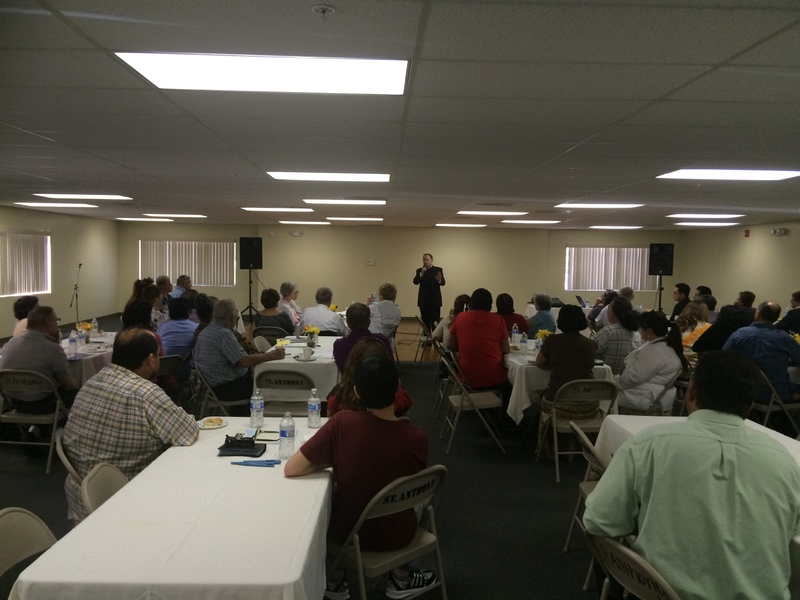 A good number spoke to a packed church about the inspiration they drew from their new patrons. 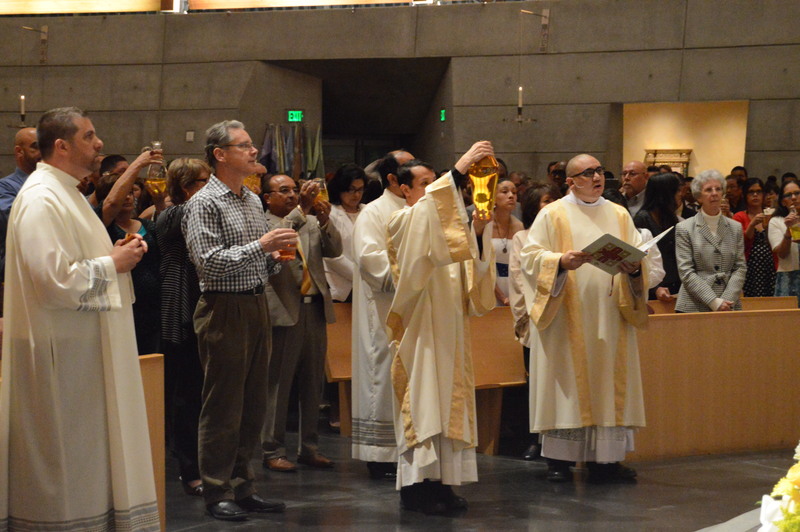 On Sunday afternoon, I was invited by the Oakland Catholic Worker community to celebrate Mass in commemoration of the martyrdom of Archbishop Romero, which took place on March 24, 1980. This year was particularly special, as the Holy Father has just approved the Beatification of Archbishop Romero, which will take place in El Salvador on May 23rd. So many people attended, we had to have the Mass outside, under tents. Everything was in Spanish. At the request of the Salvadoran Catholic community of our diocese, we will arrange a special Mass in our Cathedral in honor of the Blessed Oscar Romero (date TBA). 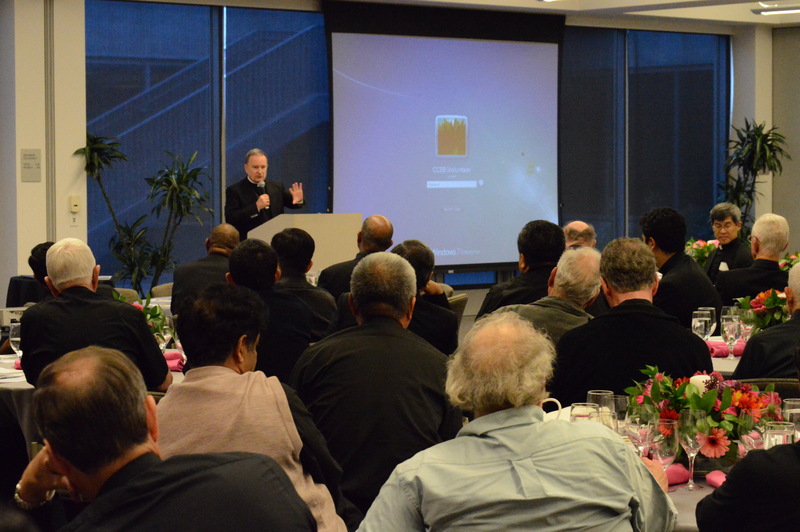 I am very proud and pleased at the spiritual and corporal works of mercy offered by the Catholic Worker communities (Oakland and Berkeley) in our diocese. They quietly and faithfully house immigrants and refugees, shelter those who are in trouble, and consistently feed the poor. All this service is given with love for Christ and the Church, as exemplified in the life of their founder, Dorothy Day. I await with hope the day she will likewise be beatified by the Church. Last week I traveled around the Diocese, and the Country. Fr. Michael Lacey invited me to St. John the Baptist parish in San Lorenzo for a Capital Campaign reception. The parish is excited because they have just bought a large parcel of property next door and can finally create a proper playground for the students in their parish school. 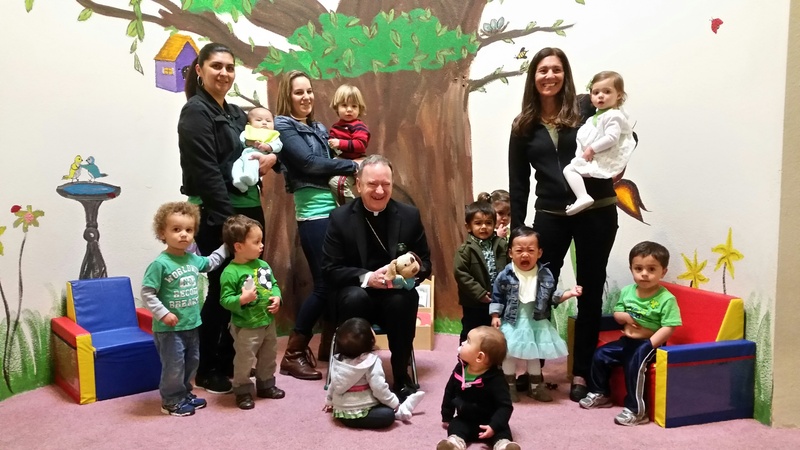 The parish had been landlocked for years, but with the help of the diocese, the parish was able to acquire an adjoining Japanese nursery which ceased operations. 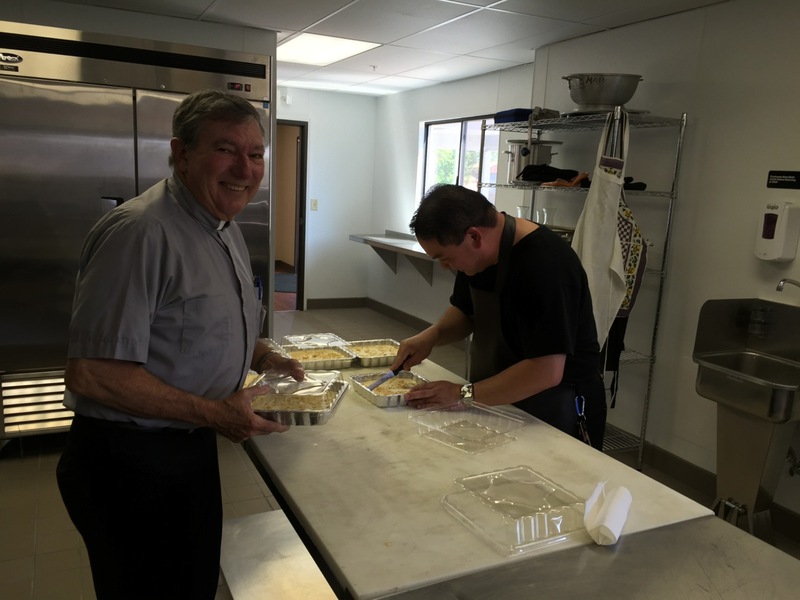 The Diocesan Capital Campaign is designed for such opportunities. 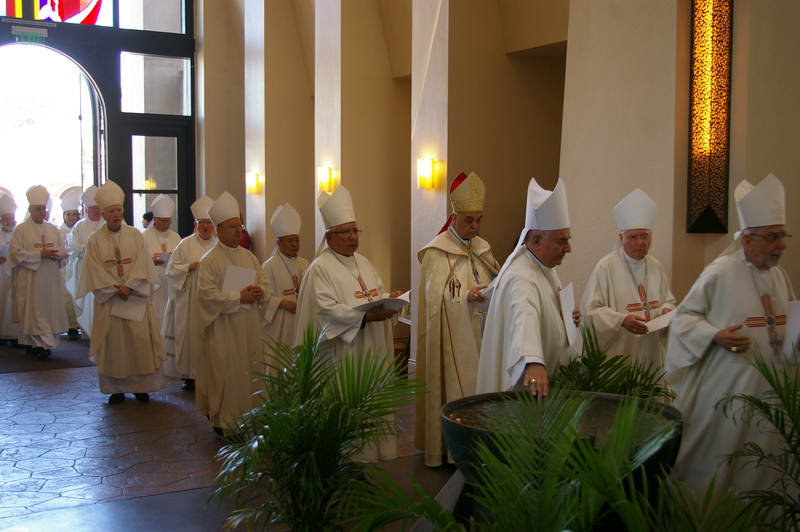 Strong parishes make for a strong diocese. 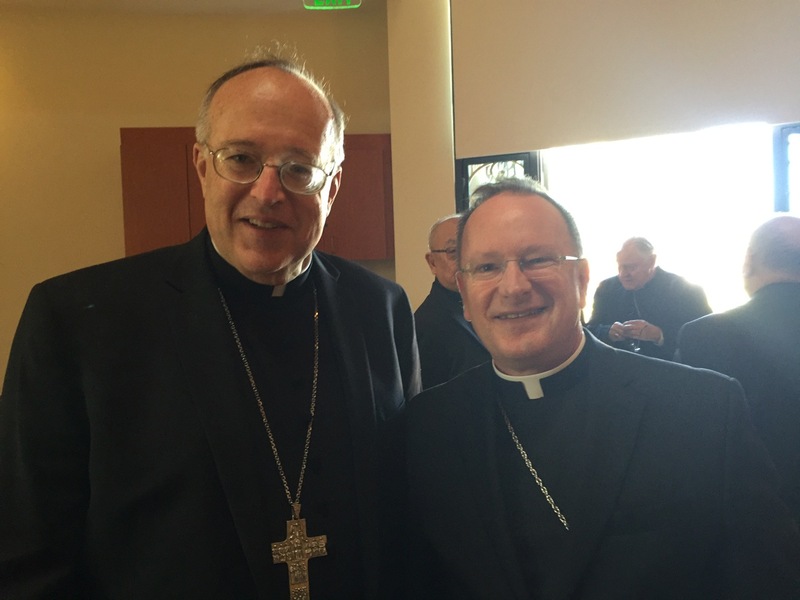 On Wednesday I flew to Washington, D.C. for a meeting at the US Conference of Catholic Bishops (USCCB) headquarters. I am on the “Higher Education” committee, helping Catholic Colleges and Universities strengthen their Catholic identity and mission. 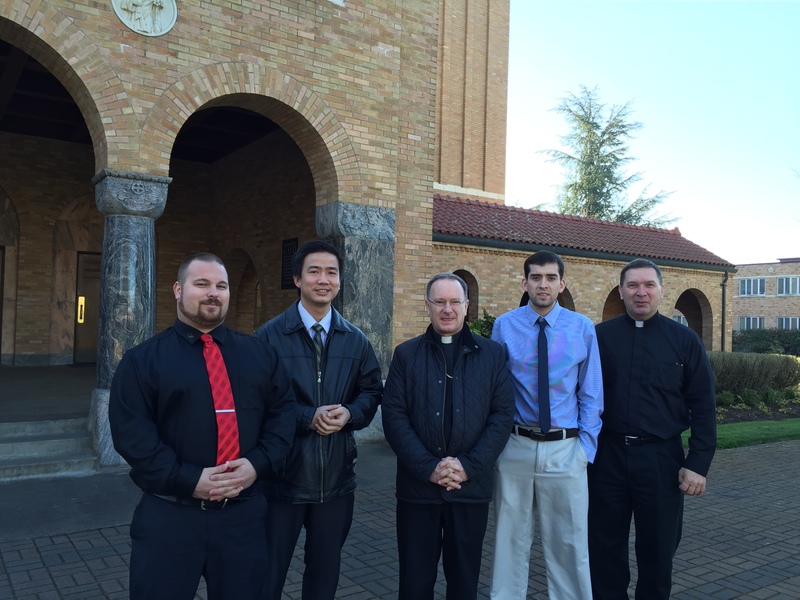 I stayed with the Jesuit Community at Gonzaga College High School. 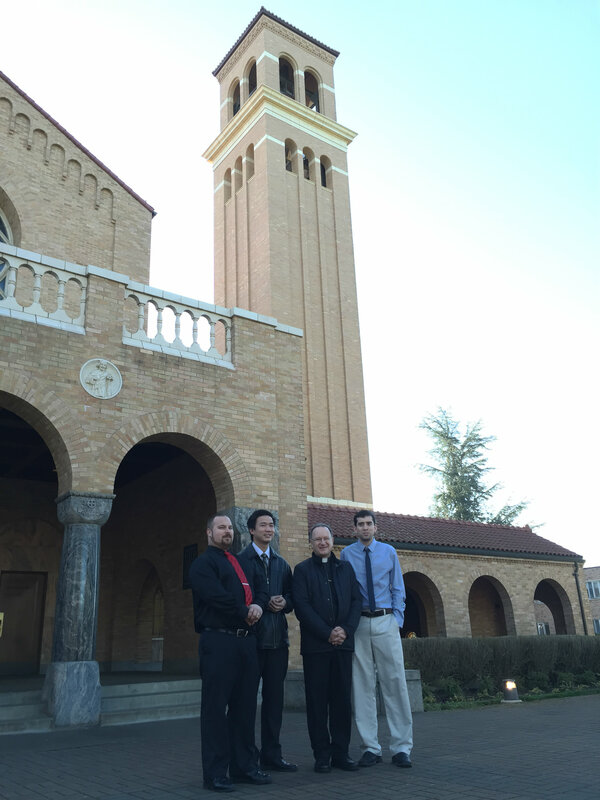 Founded in 1821, it is one of the oldest Jesuit apostolates in the USA. Here’s a view of St. Aloysius, the parish church attached to the school. Last Saturday we hosted the University of Notre Dame Glee Club at the Oakland Cathedral. They gave a Benefit Concert for FACE: “Family Aid for Catholic Education.” This is a fund that helps parents with financial aid to send their children to our diocesan Catholic schools. The Glee Club sang a variety of music, from sacred to barbershop quartets. We enjoyed their music, and the choir clearly loved singing in our majestic cathedral with its impressive acoustics. Notre Dame University also helps our diocese by providing “ACE teachers” (Alliance for Catholic Education) who help in our urban Catholic grammar schools. 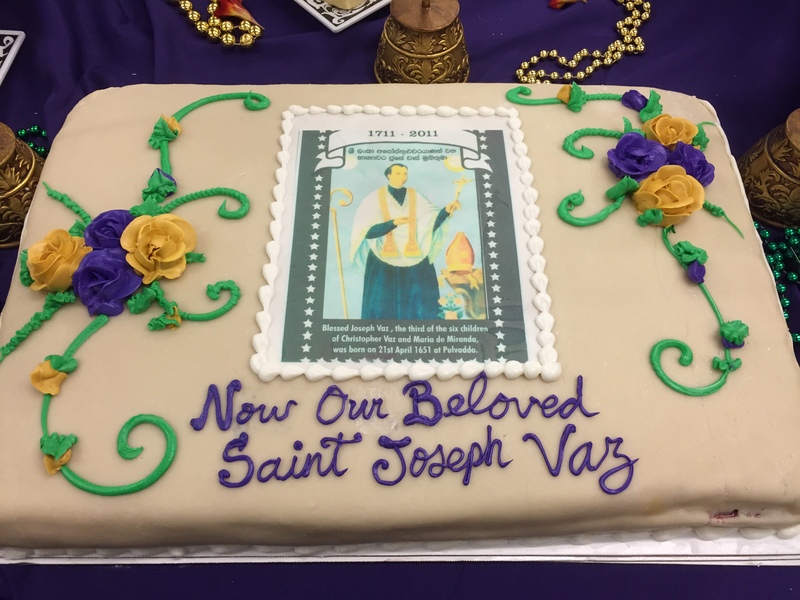 On Sunday we had a “Double-Header”: Morning Mass in the Cathedral in honor of St. Joseph Vaz, newly canonized saint from Sri Lanka. In the afternoon, I celebrated Mass for our diocesan Indonesian Catholic Community. The morning Mass was preceded by a Buddhist choir who came to sing hymns of peace in honor of the new Saint. Joseph Vaz was an Oratorian Catholic priest of Indian birth who went as a missionary in Sri Lanka in the 17th century. He was protected by the Buddhist king from arrest by the Calvinist Dutch colonizers. Without Buddhist protection, he would not have been able to carry out his ministry. The Buddhist choir came to celebrate that connection. Although I have seen fervent Hindus venerating the tombs of St. Francis Xavier and Mother Teresa, it is the first time I have heard a Buddhist choir sing in honor of a Catholic saint in a Catholic cathedral. I was very grateful for their visit and their reverence. 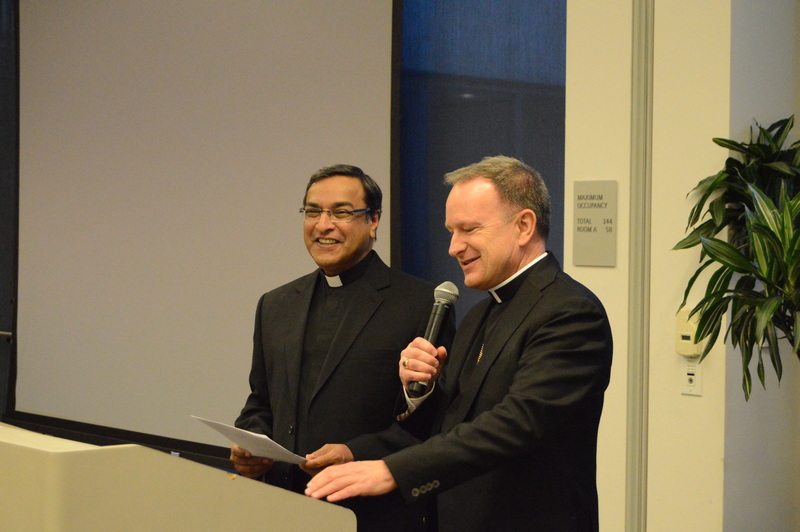 We had a very good turnout of Indian and Sri Lankan Catholics from our diocese. Pope Francis just performed the official canonization on his visit to Sri Lanka in January of this year. The afternoon Mass with the Indonesian community was held at St. Anne’s Church in Union City, thanks to the hospitality of the pastor, Fr. Geoffrey Baraan. I was intrigued by the Indonesian choir and their unusual wooden instruments. The exotic sounds reminded me of the Arthur Lyman records my parents used to listen to when I was a kid. Catholicism is a minority in Indonesia. The largest Muslim country in the world, only 3% of the population is Catholic. In spite of this, the Catholic Church is famous there for our Schools, where many Muslims send their children to be educated. Our Mass was preceded and followed by elegant traditional dances, which in the culture are used to welcome and honor guests. The youth who danced were reverent, respectful, and exceedingly graceful. There is so much joy and kindness in the Indonesian Catholic community, and they contribute so much to the rich makeup of our diocese. It is a beautiful spot, about an hour and a half outside Portland. It was about 20 degrees cooler there than Oakland, that’s why the guys without coats are shivering in the photo. 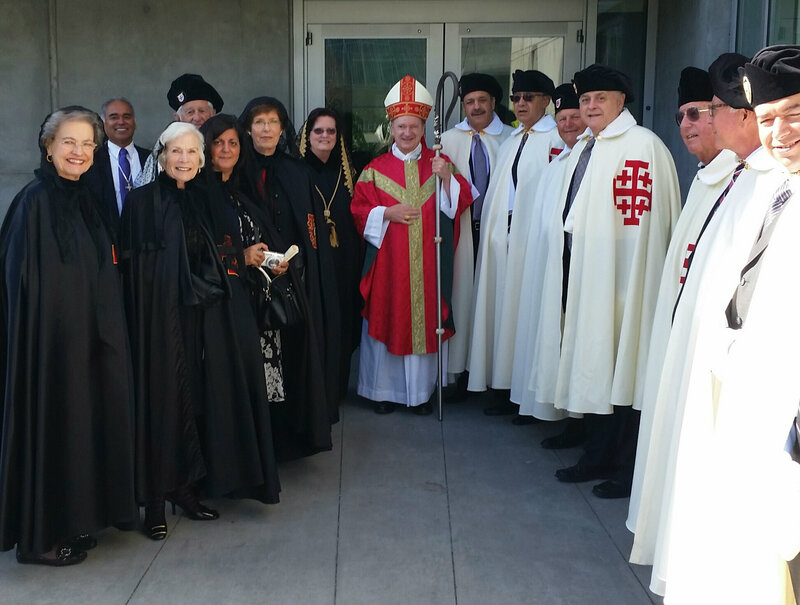 Also last week I visited St. Leander’s parish, San Leandro, for a Capital Campaign reception. One of our diocese’s oldest parishes, St. Leander’s has a great diversity of parishioners: Portuguese, Italian, Anglo, and now a large Latino congregation. We held the reception in English and Spanish. I also got to practice my Italian. 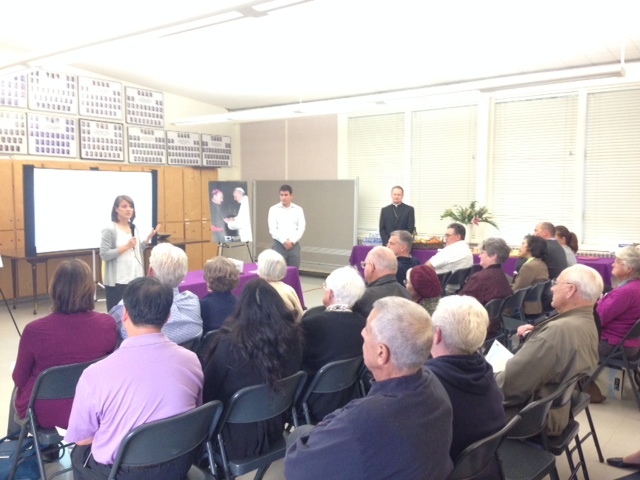 On Thursday we had the kick-off meeting to begin a feasibility study for a new Cristo Rey High School in Oakland. The former director of Catholic Charities, Steve Wilcox, is heading the project, and we were pleased to have representatives from the Chicago-based Cristo Rey Network join us. This is a unique model, where students attend classes four days a week, and work in a business on the fifth. The school is designed for students from low-income families who may not have the financial resources for Catholic school tuition. Money earned by working is applied to their tuition. You’ll definitely hear more about this project in the months ahead. 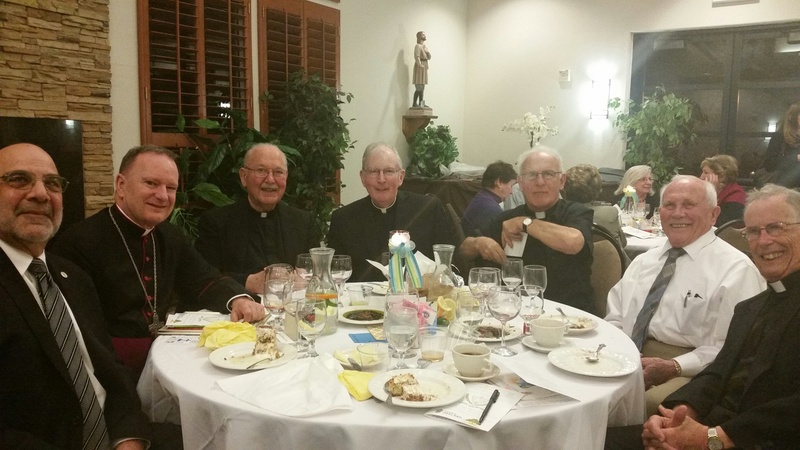 Friday evening brought another Capital Campaign reception, this time at St. Margaret Mary parish in Oakland. Fr. 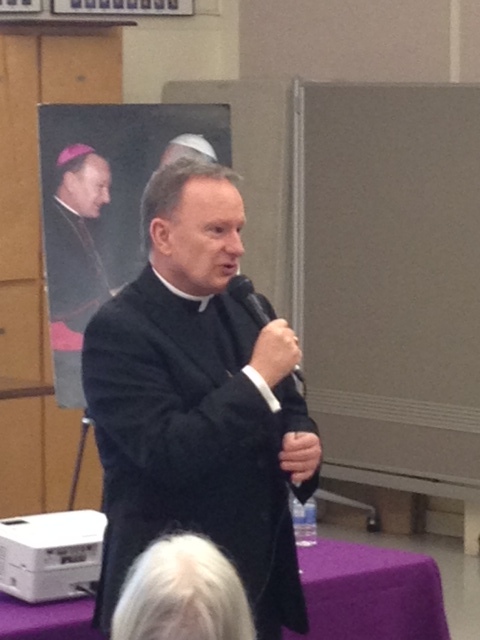 Rafal Duda scheduled a Lenten dinner following Stations of the Cross, which insured a huge turnout. St. Margaret Mary’s also attracts parishioners from the West Bay who cross bridges to attend their Extraordinary Form Latin Mass, celebrated by Canon Meney of the Institute of Christ the King Sovereign Priest. Thanks to Jay Balza for these photos. Last Saturday and Sunday I spent the weekend at St. Isidore’s in Danville. 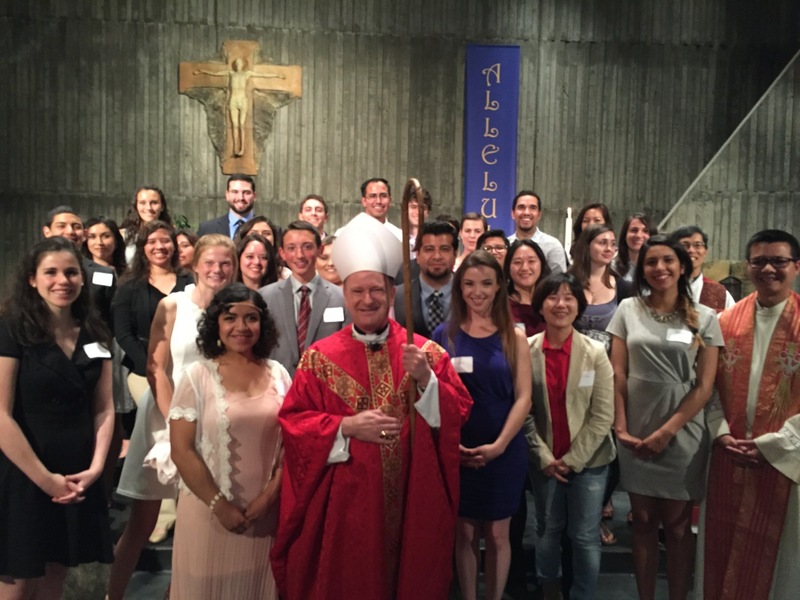 In my almost two years as bishop of Oakland, I had not yet had the chance to pay an official visit to the parish. I made up for it by preaching at all the Masses . . . so I could literally “meet everybody.” The pastor, Fr. Gerald Moran and his new vicar Fr. 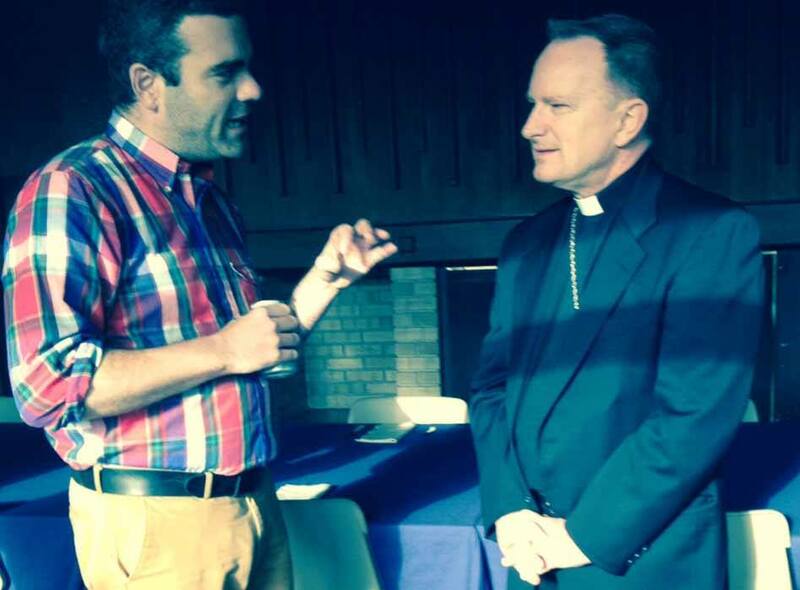 Gerald Pedrera warmly welcomed me to the rectory, as did hundreds of parishioners at coffee and doughnuts after Mass. 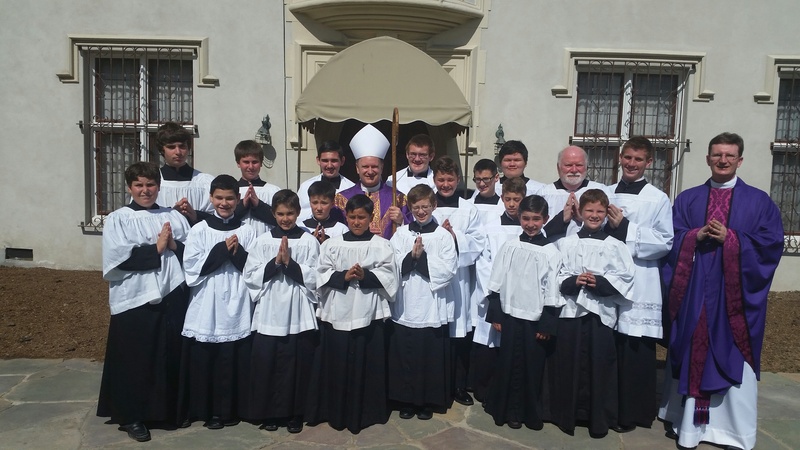 St. Isidore’s is one of the very few parishes left in California that has a “double” Catholic school: two classes of every grade. 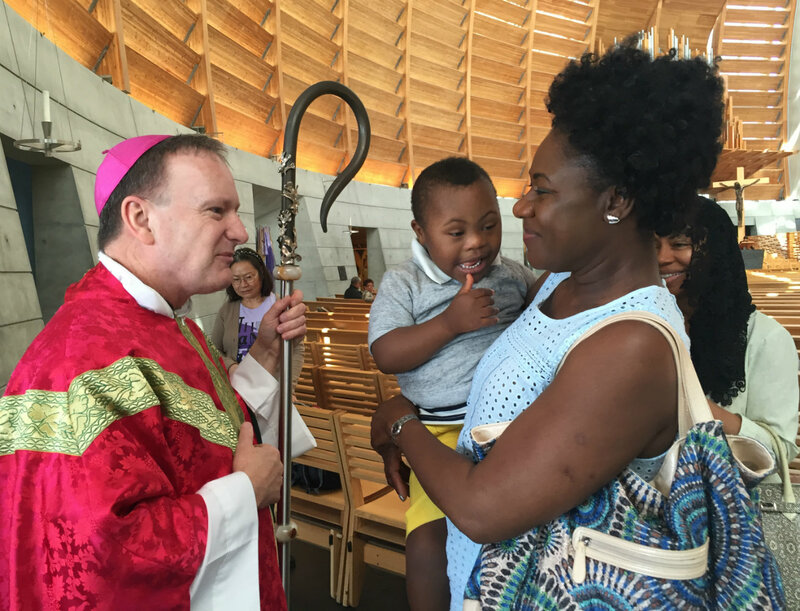 I was happy to see so many families at Mass.